Building a shed can seem a fairly simple project. But where to start? There is a ton of information and advice on this site but what would really help would be step by step guide with all the dimensions and details you need to get you going. Whenever you are doing anything for the first time it can be a daunting process and there are a lot of potential mistakes to make. If you are building something of the size and permanence of a shed then you you want to make sure that you keep those mistakes to a minimum. That is where these plans can help. Not only do they give you detailed blueprints for each component and assembly they also give you illustrated step by step instructions to help you build your shed project right..first time. 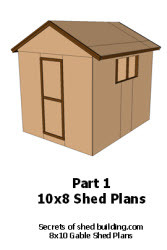 Shed plans - Detailed plans eliminate any guess work and enable you to see each part of the shed you are going to build in detail. Material lists - A set of plans is great but you need a list of all the parts so that you can go out and buy them. Having a list of the material that you need can save you the cost of these plans alone when you are shopping around the builders merchants. How to articles for each major section of the project - It's great to have shed plans but wouldn't it be nice to have a bit of chat about how the bits go together? The articles in the instructions do just that including hints and tips on foundations flooring, walls, roofing and doors. 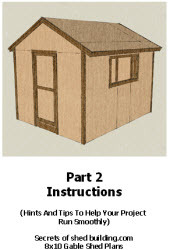 Illustrated construction sequence - What is the right order to build your shed in? Of course it's best to start at the bottom and work up. But how do you hold one wall in position whilst you build the next? And where do you start when it is time to put the roof trusses in to place? All this is shown and more..
Construction details - OK, you have cut all the components but how do they fit together? How does one panel sit in relation to another? Three dimensional details are included for each stage of construction that don't leave anything to the imagination. Sketches to makes sure your shed fits in with the planning rules - Wherever you live there are rules about what you can build in your garden these general views of shed show elevations from all four sides of your new building. 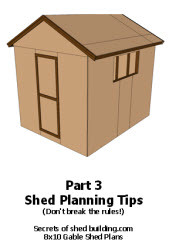 Also includes advice on how to approach the planners and find out how to make sure that your shed fits in with the rules. Dimensions for components - Each major part of the shed is made up of a number of smaller components. The plans give details for so each piece of timber can be cut to the right shape and length. Fixings and spacing - The shed framework is held together with screws, nails. How many and what type of screw and bolt do you need to securely fasten the parts of the shed together? The material list gives you details of the types of fixings and lengths and how many you need to buy. When it comes to construction the plans show you which fixings go where, what size, how many and at what spacing. You need this information so that the connection is not too weak or too strong. Buying tips - The price of building materials varies widely between suppliers. How do you know you are paying the best price on your building materials? Where do you go to get your shed hardware? The hints and tips section includes advice on materials buying that will more than pay for the price of the plans. Material specifications - Timber is available in various strength grades and with different preservative treatments. Using the wrong type of wood in the wrong place can shorten the lift of your shed. The instructions help you to use the right material in the foundations, floors, walls and roof to give your shed the best chance possible in life. Timber sizes - Just what sizes of timber should you use for your shed? Is it worth it to use smaller sizes? Is there any benefit of using bigger timbers? The three documents together represent a great way to get your project off to a smooth start. Know exactly what you are going to build before you build it. Use the Buy Now button below to pay using credit card or through Paypal and the plans can be on your desktop within minutes. The plans come with full support. If you have any questions feel free to email me.